Complex systems that they are, automatic garage doors can experience a whole slew of different malfunctions, both mechanical and electronic. Their intricate nature, and the great tension their moving parts are constantly under make any repair work extremely dangerous. That's what our team is here for. As some of the most crucial parts of your system, both the springs and the rollers are susceptible to wear and tear damage. When even one of them breaks or becomes worse for wear, not only will the entire system be compromised, the door panels could potentially even get off track and collapse. Expert assistance is required when it comes to handling these components, and you should never attempt to replace or repair any of them by yourself. Contact our professional technicians to get it done quickly and safely. 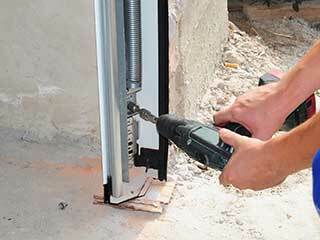 The opener is the device that makes you door's operation become automated. As a result, it can suffer its fair share of issues. From worn out or broken motor gears to fried or disconnected circuit boards, there's no problem our experts can efficiently resolve. Your garage door track and cables are very important, as they make sure your door moves steadily in a confined and predetermined path. If the condition of these components becomes compromised, the panels could end up collapsing. Yours wouldn't be the first garage door that got off track due to a bent hardware part of a frayed cable. Our technicians can straighten and realign these components, or replace them entirely if they've become too damaged. Any problem you may be experiencing can pose a risk for a serious injury if it isn't handled properly. Contact our experts at Garage Door Repair Elmhurst to make sure your issues are resolved by the best technicians around.